On March 9, 2016, Ochsner Hospital for Children was presented with a check for $300,000 from CN for the 2015 CN Miracle Match campaign at a reception at Ochsner Medical Center in New Orleans. Ochsner was the only U.S. hospital chosen in 2015 for this charitable initiative – and the second U.S. hospital selected in the history of the campaign – to rally communities to support children's hospitals in North America. The campaign raised a total of more than $627,000 from CN and over 600 organizations and individuals throughout the community, including over 400 Ochsner employees who supported the campaign via Ochsner's Physician and Employee Giving program. All proceeds will be used to help expand Ochsner Hospital for Children's Pediatric Intensive Care Unit. The expansion is scheduled to be completed in late 2016 and will increase capacity from 14 beds to 26 beds. Will Noland, CN Superintendent of Operations (shown to right of photo holding check), presents Ochsner Hospital for Children with a check for $300,000 from CN for the 2015 CN Miracle Match campaign. Ochsner Hospital for Children cares for patients from around the world with everything from rare brain tumors and leukemia to heart conditions and organ transplants. To help care for more patients, Ochsner Hospital for Children is raising funds to expand their Pediatric Intensive Care Unit and with the help of the CN Miracle Match program. CN, North America’s Railroad, is supporting Ochsner Hospital for Children’s campaign for expansion of its pediatric intensive care unit (PICU) by matching up to $300,000 in donations. Ochsner Hospital for Children has been selected as the sole U.S. beneficiary of the 2015 CN Miracle Match campaign, a charitable initiative which mobilizes communities to support children's hospitals in North America. Ochsner Hospital for Children is only the second U.S. institution to be selected since the program began in 2006. "We are tremendously grateful to CN for their support of the world-class care we provide to children and families across the region," said Vincent Adolph, M.D., Interim Pediatrics Chair, Ochsner Hospital for Children. "Not only will your contribution to the CN Miracle Match fund help us to take care of more children here at Ochsner, but it will also have twice the impact thanks to the generous pledge from CN to match donations to this fund - what a great way to give back!" Claude Mongeau, president and chief executive of CN, said: "Strong, healthy communities, particularly healthy young people, are at the forefront of our community investment focus. 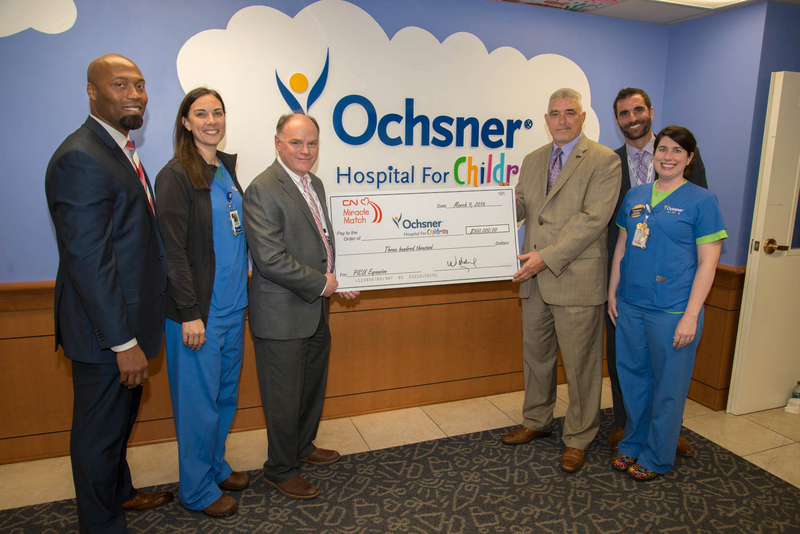 We are pleased to work with Ochsner Hospital for Children to help raise donations that will improve the quality of healthcare available to children across the regions served by the hospital." What Will the Funds Benefit? Your gift will fund expansion of the Pediatric Intensive Care Unit (PICU) to provide life-saving and life-sustaining care to our region’s children. The expansion will almost double the size of the Ochsner PICU, where children battling cancer or recovering from a transplant or other complex procedure receive expert care from the Ochsner pediatric intensive care team. Make a gift by check or credit card. Call 504-842-7117 to make a gift by credit card over the phone.